We now know that the name of this dog is Perkins. There is a similar brown one named Jenkins. My mother gave me a TY dog my freshman year of college that looked somewhat like our shih tzu. My two year old daughter now carries around this lovey and will not let it go for anything. The dog has had several washings already, and I’m afraid she may not survive many more. Thanks to my daughter’s ability to drop her in dirt or get sick on her, she has had more baths than most stuffed animals. As this is my daughter’s security toy, I am desperate to find another. I know the dog was made in 2000. The Ty tag with the dog’s name has been gone for years, and I cannot remember it. 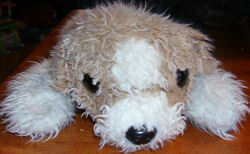 The dog looks furry and is white with large light brown spots. She now lies flat on her tummy and I cannot remember if she always laid that way or not. I think that she did. If you have any idea where I can find another, I would appreciate any information. I know my daughter will be very upset to lose her lovey. Make sure you pick the latest release. Thank you so much for all the help. Perkins looks a lot like the one I’m hunting for. I’ve asked for a better picture, but will probably buy it regardless. Better to have one similar than none at all!